Hey my love,... I was eager to hear you like everyday so as to start a blissful day. Though we both slept past night as you told me that you'll call me at 1230 and since it was 1143 I was waiting. I finally lost my patience and called you at 1226 you didn't receive I went low called you again no response. And finally with low heart on this valentines day i went to sleep. But quite astound by the way you were near me was nothing less than getting rejoice of your immense love which you however afraid to accept. I could clearly see your presence near me physically as your soul had already touched my soul deep making unforgettable impressions and quite hard to leave those feelings that just aroused. I was quite shy when you came near but than was comfortable in your arms which hugged me while i was sobbing as it wasn't expected. I than lifted you on my arms and went to a hostile place where the river flows and looked for a hut and fire burning high seeing you with me together. I was a cook at that time to make you have delicious dishes that you would lick with my fingers as I will be making you taste with my hands. And then we shared a dessert together. I became very happy seeing this but then,.. a cold wind blown waking me up and I was left all alone while you had nothing to do with. And again I became alone on this valentines day....!!! 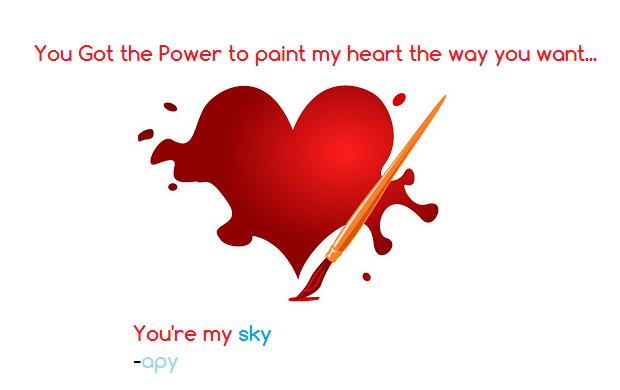 Sky and Apy is not a drama it's a love story, Love Stories Like Sky Apy don't end no matter if their life ends.